No, don’t panic. It is not the end of the world. Just some dust particles burning up in the atmosphere. On the evening of Saturday 8th October, astronomers predict there is a chance that the Draconid meteor shower may exhibit storm-force levels. This means several meteors may be visible each minute. Meteor showers are usually associated with a “parent” comet: the earth passes near the comet’s orbit and small particles left behind by the comet enter our atmosphere. There are several showers throughout the year and they usually produce a few tens of meteors per hour. Rarely, the earth passes through a denser cloud of particles and hundreds of meteors might be seen. This could happen tomorrow night some time between 8pm and midnight. Some fainter meteors won’t be visible because the Moon will interfere. Still it will be worth looking north-west from a dark spot if you can. 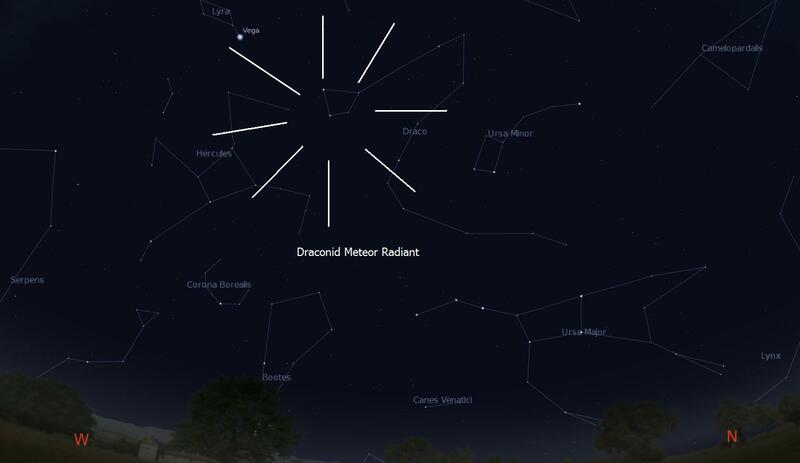 More information and observing tips can be found at the Meteor Watch site. Friday, October 7th, 20119:03 pmThis entry was posted on at and is filed under Astronomy. You can follow any responses to this entry through the RSS 2.0 feed. You can leave a response, or trackback from your own site.